Summer is here and that means it's time for fun in the sun. When the weather is nice, I love to be outside. 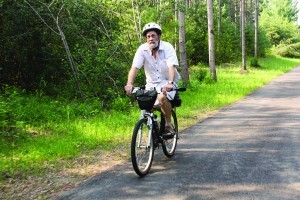 We're having extra fun this year because our area recently got a super cool new 3-mile bike trail that runs between our town and the neighboring town. It runs through different types of land, starting with a wooded area, then running over wetlands on a boardwalk-type wooden structure, and then passing through farmland. It's a fun way to get some exercise while enjoying the outdoors. With all that outside time it's important to remember the sunscreen. 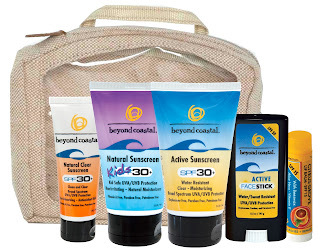 We recently had the opportunity to try sunscreen products from Beyond Coastal. Beyond Coastal sent us several different types of sun protection products, including non-mineral Active Sunscreen,Natural Sunscreen and Lip Balm. The Active Sunscreen is a sport sunscreen that is water-resistant, clear and moisturing, while providing broad-spectrum UVA/UVB protection. It's great for serious and recreational athletes who need protection while being active outdoors. I liked this sunscreen because it is light and "clean" feeling - doesn't leave a goopy mess or feel like is just laying there on your skin. It's also fragrance free. I also especially like the SPF 30 Active Face Stick, which lets you just quickly apply to your face (kind of like a deodorant stick applicator). Their Natural Sunscreen line offers all-natural UVA/UVB protection and is good for sensitive skin. It uses zinc oxide and titanium oxide and is good for kids and babies. These minerals actually sit on top of the skin and create a physical barrier that deflects the sun's rays. I again liked these because they are non-greasy feeling, which makes it much easier to get on a squirming little one as it doesn't leave their skin feeling "yucky". But, I have to say that I think my favorite of the products is the Active Lip Balm SPF 15. My lips tend to burn easily in the sun, so I try to keep them protected all the time. This lip balm is very moisturizing (it uses beeswax and shea butter) and has a nice, faint natural citrus scent. All Beyond Coastal products are Gluten Free, Cruelty Free, Fragrance Free, Oxybenzone Free, Paraben Free and Oil Free. Reader Giveaway: One lucky Jinxy Knows Best winner will win this Beyond Coastal Prize Package (shown in this last picture). To enter, simply leave a comment on this post letting us know your family's favorite "fun in the sun activity" and then fill out the form below by 11:59 PM ET on 6/2/12. Good luck! Disclosure: I received product to review via Global Influence. Any opinions expressed are my own. Our favorite fun in the sun activity is looking for shark's teeth at the beach. We've always loved the water...whether a pool, water park or the ocean. We love the sun doing outdoor yard and gardening. We like to swim in Lake Superior! My family’s favorite fun in the sun activity is swimming on the lake. We love going camping and swimming. Hiking and swimming are our favorites. We love to go to the park and have picnics. We like to have picnics in the park! Our family loves to go to the beach to play volleyball. We play volleyball and jump into the water to cool off. Our favorite sun activity is camping. We like to go to the pool and play in the sprinklers. Love to go to the ocean. We love bike riding and kayaking. We love relaxing at the beach. we are on our bicyles all the time! family bbq's and swimming!Love it! We love to play badminton. We love hiking and camping. My family’s favorite fun in the sun activity is swimming. Our family is often found outside in the front yard throwing frisbees to each other. Many times the neighborhood kids come play too. It's a blast! Our favorite activity is hiking. We love swimming in our pool. We love to get in the pool and would like to start golfing together again. the beach!!! Shelling, sandcastles, walking, wave jumping, swimming, sitting in the sun, picnic on the beach, beach volleyball... the beach offers so much to do! We love to go boating. We love having a family bikeride! Our favorite activity is hiking in the Sierra Nevada Mountains and if not hiking we enjoy walking our dog when RVing. We love swimming in the pool! Thanks for the giveaway...we love swimming !